Yesterday, January 24th, would have been my parents’ 66th wedding anniversary. Despite managing to stay together more than a quarter century before finally throwing in the towel, and despite sharing in the creation of a passel of kids, my parents disagreed far more than they agreed. My father was German and loved herring and stinky Limburger cheese; my mother was from West Texas and loved okra and chiles. My father was raised an only child; my mother was one of 12, 10 of whom lived to adulthood. My mother was basically lackadaisical about time; my father loved clocks. One hung over the fireplace in the living room. A great big wall-mounted version of a grandfather clock, is the way I always thought of it. It was probably three feet tall, with a great big face, and it gonged out the hours and half hours with what I recall was a Westminster chime. And it had to be wound, with a key, on a regular basis. A job in which my father delighted. It appealed to his German soul. The other hung on the wall at the top of the stairs in the Dutch colonial home where I grew up. If you’re not familiar with the layout of a Dutch colonial, every one I’ve ever been in has stairs that begin in the living room, rise two or three steps to a landing, turn and go up a flight to another landing and then turn and rise two or three steps to a hallway. And on the wall above the second landing was the clock. It wasn’t particularly large, as I recall. Perhaps 12 or 15 inches in height. Like all traditional cuckoo clocks, it was powered by weights and chains. And, as often as need be, my father would pull the chains to raise the weights that powered the clock movements. It looked quite a bit like the one you see here: with the one door at the top — for the cuckoo that appeared once an hour, every hour, on the hour, to announce the time. I don’t recall it being any kind of a family heirloom — I believe it was something my parents acquired during a year-long residence in Europe when my sister and I were small. And I absolutely know we had it in the house I grew up in by the time my brother Paul was born. I know that because of the email I received yesterday from my mother’s youngest sister, my Aunt Trisha. I’ve been laughing ever since, and I have to share this. First, the players in this drama. My grandmother, Opal Robertson Cottrell. My aunt Trisha, the youngest of my mother’s siblings, who would have been not quite 13 at the time. The cousins, Susan and Barbara, children of other aunts who worked and had to leave them in my grandmother’s care. Both of them would have been toddlers — not more than 12 to 18 months old. And the key player: the clock. Now… what does it say about me that I’m already plotting a birthday or Christmas gift…? It says, simply, your EEEEVUL has become predictable! Why… why… why, THANK YOU, Dave! Does anyone, anywhere, actually like these instruments of torture? What it says about you is that you are Judy Russell—and that you’re being yourself!! I know this after only twelve years or so of knowing you! You give off vibes, my dear cousin. 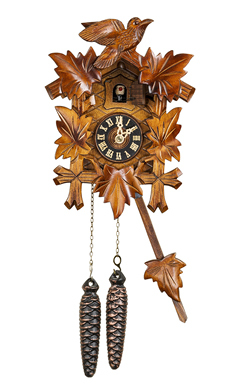 It must be my heritage – I’m all German on both sides – but I love cuckoo clocks. Back in the early-1960s, my grandparents had their kitchen repainted. Center stage in the kitchen was a large (maybe two feet tall) cuckoo clock that I had loved to hear calling off the hours whenever I was there. Now the kitchen is not an ideal place for a intricately carved wood clock, as over the forty-odd years it had hung there it had – despite my grandmother’s penchant for keeping an immaculate kitchen – accumulated a good deal of kitchen grease. My grandfather attempted to clean it at one point and had covered the surface with some sort of oil to enhance the wood, which, of course, only provided a more-welcoming surface for the grease and dust to cling to. Added to this was the fact that the clock had been a wedding gift for my grandfather’s first marriage, and my grandmother decided it was time for an electric clock. Down came the old cuckoo – much to my distress. Rather than see it stashed away in the storeroom, I volunteered to take it. For the next couple years it hung in the hallway outside my bedroom. I had attempted to clean it, but my 14-year-old self wasn’t up to the task. Eventually my dad painted the hallway and the clock came down. By then I was 16 or 17 and was too interested in boys and the Beatles to pay it much attention. It went into our basement and at some point my dad threw it out. I didn’t miss it until years later when I inquired about it – hoping to hang it in my own house – and was saddened to learn it was long gone. My husband and I are now regulars at a German restaurant which features “North America’s largest cuckoo clock.” Unfortunately, despite being overseen by a native German, the time is frequently wrong, and it’s electric. Sigh. Don’t tell my Aunt Trisha… but I always loved our cuckoo clock, too, Lauren! And I’m so sorry you don’t have the one from your childhood. This is so timely! We just had a 100 year-old cuckoo clock restored, and until we open up the NY house in the Catskills next Spring, hung it in our apartment in Lowell. The cuckoo sound for some reason sounds more like a toy train than a bird to my ear, and I grew to dislike hearing it, especially around 11 or 12 o’clock. We’ve let it run down, but perhaps once it’s downstairs at the house, those late night cuckoos won’t be so annoying. Didn’t seem to bother John, but then, he is Swiss-German (Zimmerman). My Scots-Irish genes just couldn’t take it! I think you have to grow up with one to really like it. Many years ago, I had two cuckoo clocks. They really annoyed our Old English Sheepdog, poor thing. I gave up the clocks in the divorce. Guess who got the last laugh?!? I assume you got custody of the sheepdog, which clearly makes you the winner here! Actually, my mother-in-law took the sheepdog. She had a sizeable fenced yard, and I was moving into a 2-bedroom apartment. So it was the best move for the dog, and he got away from those damned clocks! Lol! That works, too! Especially for the poor dog. Great story, you just laid out your birthday gift….enjoyed it. I believe Susan and I would have been “holy terrors” with or without the cuckoo clock….They are quite “scary” to little ones. Love you Judy but you don’t have to even think about gifting cuckoo’s. Our family comes equipped naturally. 🙂 I loved this story! I am a crazy person who likes clocks (even cuckoo clocks)! In fact, I sell them on my website. I would love to help you all with your “PLANNED GIFTS” of torture… lol! On a side note, where is the clock now? I wish we knew where it was now, Rochelle. I don’t know what happened to it after my father’s death.